Length of 4", Diameter of 3"
Protect your stored gear with this extra-small LensPouch from LensCoat. This lens pouch is 4" in length and 3" in diameter, comfortably fitting lenses one inch smaller in measurements for safe storage and transport. It is made of a soft neoprene material and comes in a solid black color. The lens pouch features a simple pull-cord closure for retrieving and storing your equipment, and a sewn-in belt loop for easy carrying while shooting. Included with the product is a removable front element protection disc for lenses, as well as a carabiner for clipping the lens pouch to a camera bag or jacket. This product is made in the USA. Box Dimensions (LxWxH) 5.0 x 5.0 x 3.0"
LensPouch (Extra Small, Black) is rated 4.5 out of 5 by 59. Rated 5 out of 5 by CHG CANON from Check reviews from others w/ your lens Unlike other lens manufactures, Canon provides a protective pouch only with their L lenses. I find these LensCoat bags to be the perfect solution. You can't always tell from the size description which size will be correct for your needs. I use the extra small size for my Canon EF 50mm f/1.8 and my slight smaller FD 50mm f/1.4 lenses. I've really appreciated others who have listed the lenses they use for size pouch and others. Rated 5 out of 5 by jeanetteb from Great Lens Coat I love these neoprene pouches. I was just on a sailboat trip in Alaska and when we were motoring very slowly to glaciers or other scenic spots, I would hook the extra lenses on the lifeline of the boat near where I sit to take all my pictures. One of the crew even asked what pouches they were because it was a great idea to be able to hook them on the boat and keep them secure from moisture with the neoprene material. I will always buy these pouches for my lenses. Most of my trips are sailing and when you know there will be great photo ops requiring multiple lenses, that's a perfect time to grab these pouches and hook them on a line to keep them secure from banging and the elements. Rated 4 out of 5 by JKM from Only option in this size This seems to be the only lens pouch of this size, which B&H carries currently. I wish it were a mm or two thicker, but that said, it's a solid choice and gets the job done. Useful for providing extra padding to a 50mm or similar small lens. A tad expensive compared to similar products from other manufacturers. Rated 2 out of 5 by Anonymous from really small This is the pouch that is listed below the Tamron 60mm macro lens. I figured if it is grouped as an accessory, it must be the guy to get. Well, it is so small that the pull string doesn't completely close around the top end of the lens. Not a big deal I suppose, but I would go one size larger if I could do it again. Still, it works, and attaches to my main camera bag. It would be great for a still smaller lens. Rated 5 out of 5 by Sara the Photog from Great product! This lens pouch is well made. I love the material and the way the draw string is set up with only one draw string. I have another lens pouch made by another well known camera company and it has one on each side which is a bit more difficult to maneuver. I have not yet used the clip, but I like the option and think it will come in handy. Rated 5 out of 5 by Anonymous from Nice Pouch For me, this is a perfect size for the either of the two kit lens (18-55mm and 50-200mm)for my Pentax k-7. It's a snug fit but more than adequate. The pouch will stretch and close over either lens but without stretching it leaves the end cap uncovered. Fits nicely in my camera bag without taking any extra room. 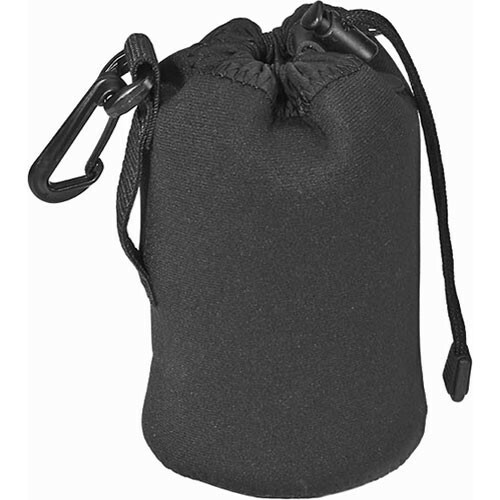 Rated 4 out of 5 by Anonymous from Works just fine I ordered this small pouch to protect my 16mm Nex wide angle lens. It has plenty of room for this and will if pushed a bit protect the 18-55 Kit lens as well. There is a clip on the one side and the closure has a stop to hold the pouch closed. It is generally very well made and worth the small investment.